F1 2017 patch update 1.8 will be made available for download on Xbox One and PlayStation 4 in the coming days, but the update is being made available today, October 11, 2017, for anyone playing on Steam. 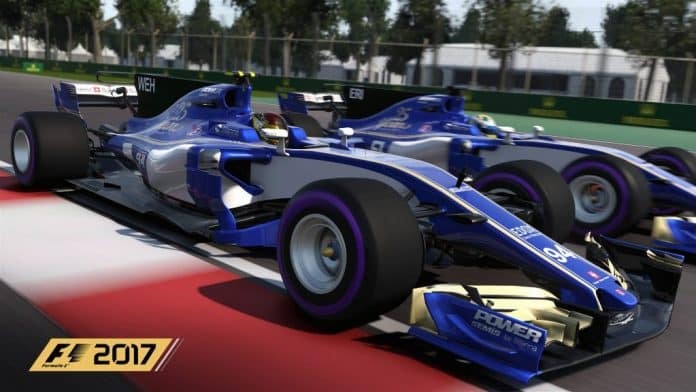 Patch 1.8’s highlights include the addition of the brand new “spectators” mode, updates to F1’s liveries, and improves the performance of cars. You can check out F1 2017 patch 1.8 full notes and details below. New Spectator UI has been added to game. Fixed issue where players could be disqualified at the end of a race if they were disqualified during the formation lap. Fixed an issue where using an instant replay in practice and qualifying could cause the tyre models on all cars to disappear. Fixed an issue with lod popping on drivers heads when looking backwards with the camera during a race. Fixed an issue where changing display resolution or Alt-Tabbing during gameplay caused severe lighting and graphical issues. Fixed an issue where a white object was clipping through the players helmet. Fixed an issue with incorrect car images being shown in the standings screen after resuming a classic championship. Fixed an audio issue with the end of race commentary incorrectly stating a SC made an impact in the race after only a VSC was used in race. Fixed an issue where the AI attempts to overtake a player with FW damage under SC conditions and then receive no penalties. In career mode players can now use the laptop and not lose the opportunity to compete in a invitational event. Driver number No 1 appears on car instead of 0 after winning drivers championship. Fixed an issue where stop-go penalties could be ignored without receiving a penalty. Added pre-set controls for Heusinkveld pedals. Fixed an issue where gearbox wear would stay at 0% when using no assists and manual gears during a 100% race weekend. Fixed an issue where Sauber and Mercedes were always the most interested teams when reputation levels are maxed out. If you haven’t already, be sure to check out SGO’s review of F1 2017 and check back often for the latest news and notes regarding F1 Sports 2017.